The Collapsing Empire will be given a fair amount of consideration on many 2018 Hugo nominators’ lists. Based on how fun this book is at times, that consideration is probably warranted. 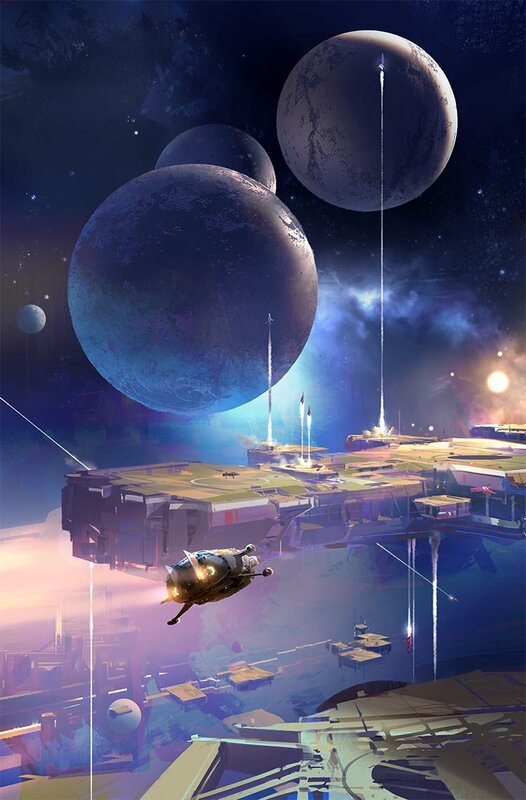 The novel is set in an interstellar empire tied together by limited faster-than-light traderoutes known as ‘the Flow.’ This empire — The Interdependency — has lasted for millennia because of the economic dependence of its member worlds to each other. The key protagonists are the new Empress of the Interdependency, and the son of a scientist on a distant world whose father has spent decades discovering that the flow is going to collapse. The overaching plot — which has some parallels to Asimov’s Foundation— is expertly constructed and well-paced. Although the characters all seemed to speak with a similar voice, their motivations were clear, and the conflicts felt natural. We are certainly not the first readers to note the parallels between the problems facing The Interdependency in The Collapsing Empire and global climate change in our own world. And, similarly, it is clear that incomplete knowledge can be more dangerous than no knowledge. In addition, one of the major plot points — that one of the rival factions in the political structure of the Interdependency has misunderstood important scientific research — is a nice reminder about the value of the peer review process. There are wonderful ideas that leaven the story — the Emperor’s ability to speak to computer simulations of previous emperors and to learn from their experiences is a brilliant bit of imagining that allows the author to delve into the history of the Interdependency. The problems of keeping a diverse empire together despite delays in communication are well thought through. However, The Collapsing Empire has significant flaws. For example, there is a lack of described detail in how these ideas are communicated — palaces are ‘baroque,’ but we are offered nothing beyond that. This leads to some very spare and sparse writing which moves at a fairly fast pace, but the dearth of imagery was actually distracting at times. This lack of detail brings us to a major tonal issue with the storytelling in the novel. Specifically, there is dissonance between the world Scalzi has built and the voice of the narration. This is an epic imperial tale that reads like it is being shared by a high-achieving millennial. The third-person omniscient narrator has a lot of personality — which seems very odd. The narrator sounds a lot like Scalzi’s blogging persona, speaking with breezy pop-cultural grammatical constructions. We wondered if this was a deliberate style choice. Although The Collapsing Empire is clearly written with possible sequels in mind, there is enough of a conclusion to the narrative that it could stand on its own. That being said, we’re leery of nominating a work that is bound to receive a number of follow-ups; perhaps it is now better to wait a few years so the overall work might be considered for the new Best Series category. While we aren’t going to complain if The Collapsing Empire makes it onto the Hugo shortlist next year, we have already read stronger works that will be placed higher on our ballots.